Big energy bills can bleed your budget dry, not to mention the potential impact on the environment. Cutting back on your energy consumption will help you become more ‘green’ as well as putting a bit more money back in your pocket. Here are some ways you can reduce your energy bills. Get your meter read regularly. 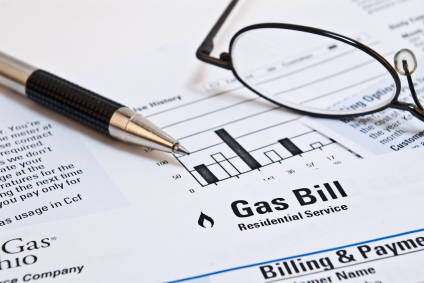 You could be paying over the odds if your bill is based on estimated readings. If you know exactly how much energy you’re using, you can take appropriate measures to cut back. Invest in home improvements. Taking steps such as fitting an energy efficient replacement boiler and decreasing heat loss in your home through double glazing and cavity wall insulation can go a long way towards bringing your heating costs down. Turn the thermostat down. Just a 1% reduction could see your energy bills drop by as much as 10%. On top of this, try setting the heating and hot water so that it only comes on when you need it to. Fix draft excluders. Heat can be lost through gaps, so you’ll probably find that plugging these will go some way towards reducing the need to turn up the heat. Check your windows too to see if they are leaking. If so, fix them and see if you can get your money back by filing a window tax credit. Switch off appliances when they’re not in use. Turn off lights and electric appliances when you’re not using them, and this includes leaving them on standby. It might sound obvious but many of us forget to do this and it’s a big source of wasted energy. Don’t do half loads. Hold off if you haven’t got enough to fill the dishwasher or washing machine for a full load. Running two partial loads will use up more energy than one big load so you’re much better off waiting when possible. Don’t boil a full kettle. If you’re only going to be boiling the kettle for one cup of tea, it’s not energy efficient to fill the kettle as you would for multiple cups of tea. Get into the habit of boiling only what you need at that particular moment and you’ll save both energy and money. Cooking tips. There are several things that you can do to minimize energy loss while cooking. Opening the oven door to check on food too often will use up heat so limit the number of times that you do this. Also, if you keep the glass panel clean, you should be able to see what’s going on in the oven quite clearly without opening the door. Also, by cutting food into smaller pieces before cooking you can potentially reduce cooking times. And lastly, it’s much more efficient to batch cook meals and freeze what you don’t need that day since you’ve only got the oven on once as opposed to multiple times. Line dry clothes. Leave clothes to dry naturally where possible rather than using the tumble dryer. Not only will you save energy but your clothes will smell fresher too. Don’t use hot wash settings. There’s no need to wash above 30 degrees unless your clothes are particularly dirty or if you have severe allergies. Look for energy efficient appliances. When you’re in the market for new household appliances, look for ones that have the Energy Saving Recommended logo. These items have met energy efficiency standards so they’re much greener. ‘A’ is the best rating down to ‘G’. Get a water efficient shower head. Switching your current shower head for one that is more water efficient can have a big impact on your water bills, especially if you shower every day. Get a rain barrel. This will collect rainwater from the roof, which you can use to do tasks such as watering the garden and washing the car. Under normal circumstances, this water would only be wasted so you might as well put it to good use! Shop around. There’s no room for loyalty if you’re trying to keep your energy bills down. Switching to a different energy supplier can save a considerable amount of money over the course of a year but don’t be too hasty – make sure that you’re getting a good deal as well as a lower price. Where I live we have an energy monopoly so this option doesn’t apply to me,but, if you have companies to choose from where you live, take advantage of it. Pay by Direct Debit. Discounts are often available if you agree to pay your bills by Direct Debit, especially if you also sign up for paperless billing and manage your bills and payments online. This is also a greener way to handle your energy bills as it cuts down on the amount of paper that’s being used. As you can see, I have only scratched the surface with ways you can reduce energy costs. There are many more options available if you just take the time to look and evaluate your own situation. The great thing about being green is not just the fact that you are helping the planet but you save yourself money. How many of us want extra money kicking around for other items? Well, going green is a way you can generate that money. I encourage you to take on this challenge and work to reduce your energy costs. The planet and your wallet will thank you. So, have you embarked on the green living path? What have you done to reduce your energy costs? Good points. I would add to incorporate a cold water wash for laundry. It cut my gas utility bill by a third. @Krantcents. Yes it is a good one. I have wrote about it previous posts. Wow- cut your bill by a third hey?! That’s amazing. Glad you have seen such a benefit from this- gives you incentive to keep doing it. Hang drying clothes is also good to do. I like these tips Miss T. We always try and use the microwave instead of the conventional oven, where appropriate. It save SOOOO much energy. @Hunter. Yes if you can use a micro wave instead of the oven it does save a ton of energy. I am glad you are trying to do your part. Is there anything else you have tried that you find works well?Please share. @Andrea. You and me are two peas in a pod. In the cooler weather I too love to put on my sweaters and slippers after a days work. I love that cozy feeling. And it’s greener like you say. – consider not using the dishwasher at all… just hand wash. It doesn’t take long either and you can do it together. – Have a bath instead of a shower (i’m not going to, but hey, you might). – Microwave your cup of water if you’re only having a little instead of the kettle at all. @Doctor Stock. Thanks for sharing. However did you know you actually use more water handwashing compared to dishwashing? It’s hard to believe but true. Microwaving water instead of a kettle is a great idea. I guess it all depends on how much you need. I have read that using a kettle to boil water before putting it in a pot for pasta is more efficient than boiling the water on the stove. Good tips, Miss T! Cutting food into smaller pieces works in the microwave too: cooks a lot faster. We use a countertop toaster oven instead of the range oven whenever possible. You heat up a smaller space & it works fine. Using a pressure cooker can really save energy costs as well as time. And it makes meat really tender! A low-flow shower head has a huge return on investment! We keep looking for more ways to save on energy since it won’t be getting any cheaper! @Maggie. These are all great tips you are sharing. Thank you. I hadn’t thought of cutting food into smaller pieces before microwaving. Great idea. We have been using our smaller appliances like toaster ovens, etc. this summer since it has been so hot. We have been trying to minimize the amount of heat we generate in the house. Which companies give you discounts for direct debit? I’ve yet to run into one myself but would love to know which support it! @SPF. I remember reading that post. I couldn’t believe it either. I have saved some money on car insurance and house insurance by going direct debit but that may just be a local thing. Check with your companies and see if they have a deal too. I boil my kettle once a day with 4 cups of water, have my morning coffee an dteh rest goes into my thermos so i can have more tea/coffees through the day. That’s great. Not only are you conserving water and energy but you also saving money by not buying coffee at work.